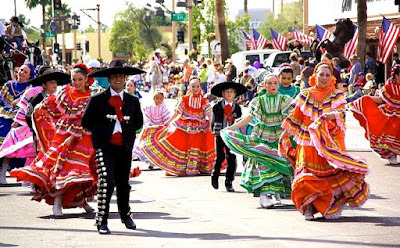 In Mexican-American communities across the US at its best popular Cinco de Mayo celebrations are a rare oportunity to share Mexican culture and traditions with parades and festivals. Promotion by those communities have elevated the celebration in the US much higher than its modest and regional observations south of the border. Note: This the eighth year I have run essentially the same post with a little tinkering on the margins. I keep telling myself I’ll skip it this year. Then I start to see all of the offensive advertising. This year the post is especially dedicated to all of the Trumpistas, their beloved Wall, and trolling every mention of a Hispanic name on social media with vile slurs and threats. A lot of them will be out partying till the puke tonight. Today is, as every hearty partier will tell you, is Cinco de Mayo. 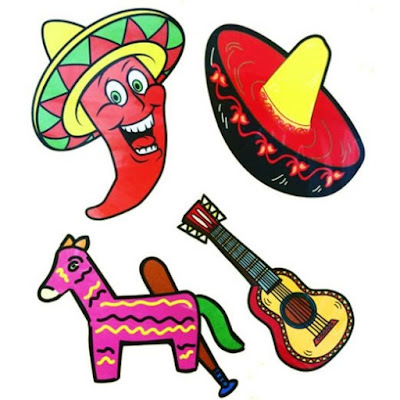 In the U.S. in recent years it has become kind of second St. Patrick’s Day decked out in sombreros and serapes instead of emerald green, toasted to with Coronas with lime and shots of tequila instead of Guinness and Jamison’s, and laid out with two-for-one taco deals instead of corn beef and cabbage plates. It is celebrated without apparent irony even by those who cheer Trump, pelt busloads of children with curses and rocks, and who send semi-literate screeds to the newspapers railing against those damned lazy, criminal immigrants. Anglos have turned the celebration into a wild party night--St. Patrick's Day with sombreros and Marguritas. Mexican-American restaurant owners and importers of spirits and trinkets appreciate the business. Grade schools have the kids make paper hats and sing Spanish songs for a one day lesson in Mexican culture. And immigrant communities hold fiestas and parades, glad that for one day of the year the rest of the country is paying attention to them in sort of a good way. If you ask most of the revelers what they are celebrating, they will mumble something vague about Mexican Independence Day. Want to exploit Cinco de Mayo for your buisness? Use this handy kit of cartoon sterotypes to create you advertisment and watch the dollars roll in! Of course they are wrong. Independence Day is Diez y Seis de Septiembre (September 16th) celebrating the day in 1810 when Father Miguel Hidalgo read the Gritto de Hidalgo beginning Mexico’s War of Independence from Spain. In Mexico Cinco de Mayo is a minor patriotic holiday observed mostly in the State of Puebla. It celebrates the victory Mexican patriots over a large, modern and well equipped French army in the Battle of Puebla on May 5, 1862. It was not even the final victory of the war against the French, who did not evacuate the country until 1866. In 1861 the President of Mexico, Benito Juarez, had been forced to default on Mexico’s heavy debt to European powers. Britain, France and other powers all made threats to redeem their debts by force if necessary. They were warned by the United States, which invoked the Monroe Doctrine, not to intervene in Mexico. French Emperor Napoleon III recognized the U.S. would be too preoccupied with its own Civil War to take action and dispatched a large French Army to take control of the country. After initial success the occupying French Army with its Mexican allies, numbering 8,000 men was met by 4,000 Mexican troops loyal to Juarez under the command of General Ignacio Zaragoza Seguín and was soundly defeated. It was an enormous moral boost for the Mexicans, but only delayed the French march on the capital of Mexico City. 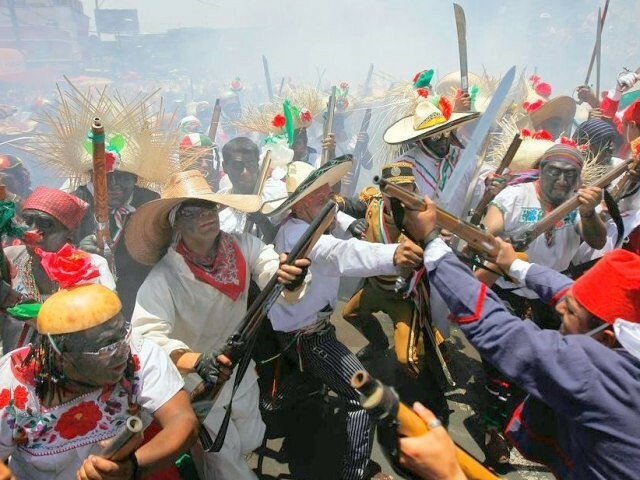 In the State of Puebla where the defeat of the French occurred 1862, Cinco de Mayo is marked with an elaborate anual battle re-enactment. In 1864 a plebiscite conducted under French guns invited the Austrian Hapsburg Prince Ferdinand Maximilian to sit as Emperor of Mexico with his wife Carlota as Empress. Maximilian did have support of some Mexican conservatives, large land owners, and the Catholic Church, but despite his liberal bent—he continued many of Juarez’s land reforms and even offered the former President the post of Prime Minister—Mexican patriots refused to recognize his rule or the French occupation that made it possible. Juarez and his supporters engaged in a grizzly war of attrition against French forces. With his army slowly being bled away and the costs of occupation far outstripping any profits to the Empire, Napoleon III began to withdraw his support. When the American Civil War ended and American intervention with a modern and battle hardened army became a distinct possibility, the French Emperor finally withdrew his troops. Maximilian, deluding himself that he was truly the popular Emperor of Mexico stayed behind with his loyal generals to fight it out with the Juaristas. Carlota made a desperate trip to Europe in which she traveled from capital to capital begging for assistance for her husband. When she failed, she suffered an emotional and mental breakdown. One by one Maximilian’s loyal armies were defeated. He was captured by republican troops after trying to make a break-out from the besieged city of Santiago de Querétaro on May 15, 1867. The would-be Emperor was tried by court martial and executed by firing squad on June 19. But if you ask any reveler at the bar tonight about any of this, all you will probably get is a blank stare and, if you’re lucky, a Margarita.